Ryan grew up in southeastern Minnesota and for twenty-some years managed to put up with the humidity, mosquitoes, and six month long winters. 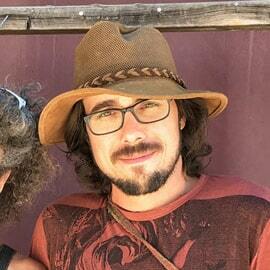 In an effort to apply some of his anti-capitalist ideals to his way of living, Ryan quit his desk job of six years, gave up his comfortable and affordable apartment, sold most of his belongings, packed what was left in his Honda Civic and headed out west to learn about natural building, permaculture, and off-grid living. After doing nine months of work-trading on several natural building projects throughout California, he discovered that a place called Quail Springs – a place that he had been hearing very good things about – was holding a natural building internship program and he jumped at the opportunity. As the internship came to a close, the offer to stay on for longer was proposed to him and gratefully accepted. As Ryan’s relationship with Quail Springs and the community therein grew deeper, so too did his roots. Much like the rest of the Quail Springs community does, Ryan has contributed to the organization in ways routine, obscure, and specialized – from washing dishes, to building cat doors, to web design. Given his skill in most things digital, he naturally and effectively fills the roll of photographer, web & graphic designer, and in-house on-demand computer problem fixer. He balances his time behind the computer as a fill-in teacher of natural building, playing in the homemade Quail Springs band, Cuyama Mama & The Hot Flashes, and the occasional evening goat walk, among other passions.